AMMAN, Jordan — “You’ve never seen UNICEF’s work before?” my colleague asked me the day before I was due to go to Za’atari refugee camp. 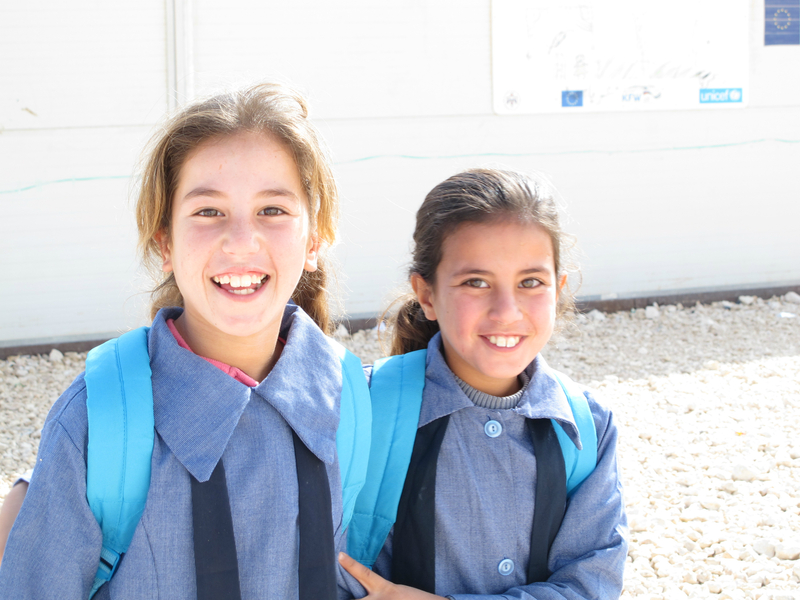 After six years of working for UNICEF – in the UK – I was finally going to see our programme work in action; and only days after beginning my secondment to the regional UNICEF Middle East and North Africa (MENA) office in Amman. With the war in Syria ongoing, and the need to raise public awareness of the humanitarian situation in and around the country, the MENA office had needed extra help with digital communications. So there I was, in my new UNICEF jacket, as ready as I’d ever be. 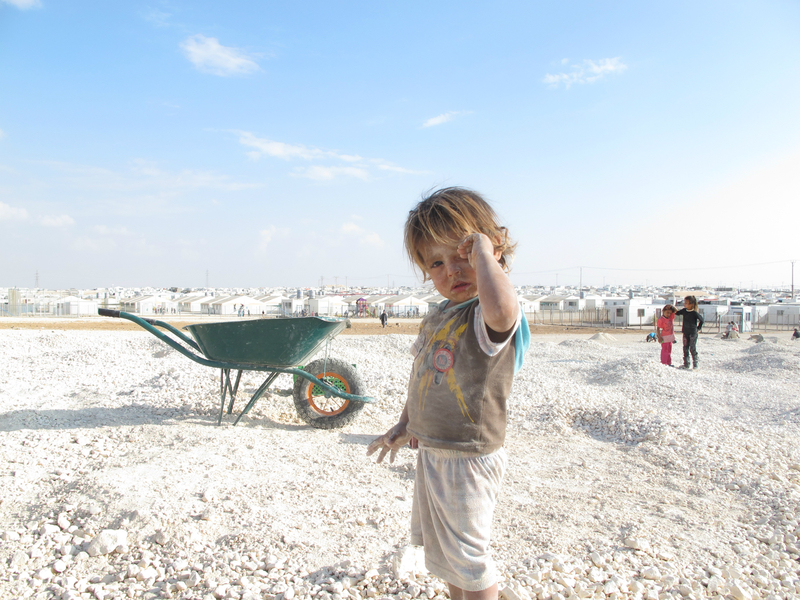 I’d been advised to visit Za’atari accompanied by someone who knows it well, and so we were greeted when we arrived at the UNICEF ‘office’ – a pre-fabricated unit at the edge of the camp – by Abed Elmajeed Noaimi. Abed Elmajeed works for UNICEF, and having worked in Za’atari since it first opened, he is known by people across the camp, and adored by the children. Since the purpose of this trip was an introduction to our work there, we agreed with Abed Elmajeed to do a whistlestop tour of the camp. “Leave it with me – I know the perfect route”, he told us, as we clambered into the car. 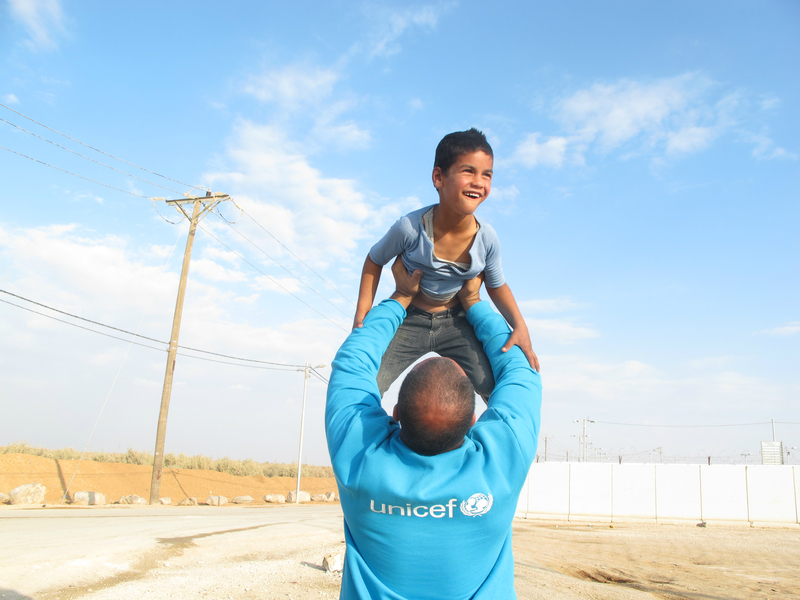 UNICEF works very closely with partners to deliver services in places like Za’atari. After a brief visit to one of the three schools at the camp, where smiling schoolgirls poured out of the buildings after their morning shift to let the boys go to their classes, we drove to a UNICEF and NRC (Norwegian Refugee Council) skills building centre. Here, teenagers learn skills that will help them get a job in the future, from maths, Arabic and IT to welding, barbering, tailoring and woodwork. As we entered a class of students learning Arabic, we were shown a barber’s chair sitting in front of a wall-mounted mirror with a wooden frame. The students had made the frame with wood that otherwise would have been thrown away, and our NRC guide told us that they often re-use materials found discarded in the camp in their classes. Our next stop was an adolescent-friendly space run by partner IMC (International Medical Corps) and funded by UNICEF. 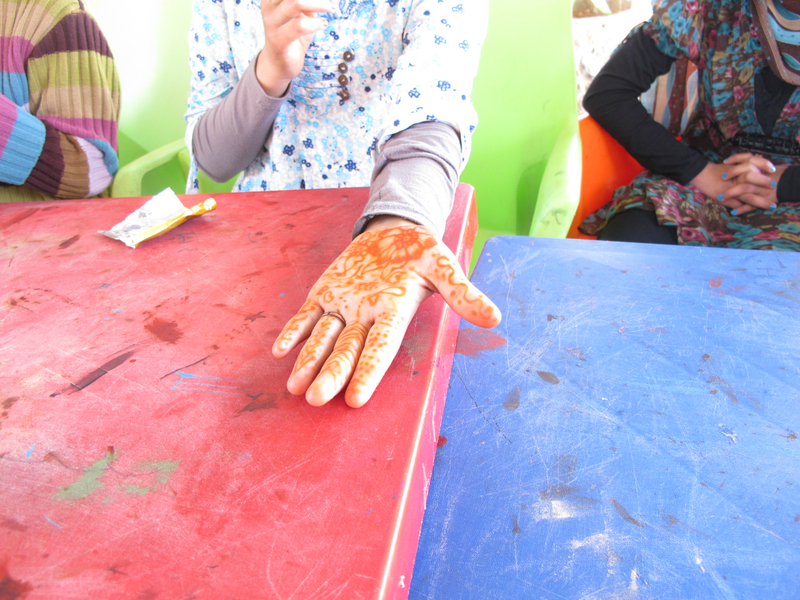 Sitting outside in the shade of a tarpaulin when we arrived was a group of girls learning to draw henna designs, and practising on each other. The space alternates with the schools in the camp, with boys attending in the mornings and girls later in the day after their school shift. We peered into one of the rooms to see artwork plastered on the walls; young people go there to draw, paint, model and sew. And they’re pretty talented – the oil paintings were particularly impressive. Across from the art room, a projector screen was set up inside a tent, and we stood to one side as a group of younger children sat and watched a short animation about penguins. When the screening finished, an adult facilitator asked them what they thought of the film, and what the moral of the story was. The point of this exercise is to get the children talking about their own experiences, and if the film raises any issues that are on their minds, they talk about it as a group so they can offer each other support. If a serious issue is raised, the child is referred for a one-to-one session with an adult. This psychosocial support helps children to open up about any traumas they’ve been through rather than bottling up their experiences, which can have deeper consequences for their health and wellbeing in the longer term. After a quick break to post pictures on the MENA Twitter and Facebook channels back at the UNICEF office, we climbed into the car again and headed towards the famous ‘Champs Elysees’, the main road running through the camp where refugees have set up shops and other businesses. On our way we drove past a dusty clearing to see children using large pick-axes to chop into the ground. Nearby, a donkey and cart waited to be loaded up with sand and rubble. When asked what they were doing, the children told us that they were separating the sand from the small stones: the sand is used to make cement blocks in preparation for the harsh winter and the small stones are laid outside the tent to prevent the ground getting muddy when heavy rains come. The children receive 1JD (equivalent to about $1.5) for each wheelbarrow of earth they produce, and it’s then sold in shops in the camp. This is a new issue for UNICEF to tackle; if children are encouraged to carry out potentially dangerous work to earn money, their health and wellbeing are at risk, as well as their education if they work instead of going to classes. Finally we reached the Champs Elysees, and as we walked down the bustling road towards the car waiting to take us back to the office, Abed Elmajeed’s popularity became apparent; a group of young boys crowded around him, wanting to hold his hand and walk with us. One boy wouldn’t let go of his hand, and after a while Abed Elmajeed gently tried to persuade him to go home, saying he was worried the boy might get lost. “No, I’m worried that you’ll get lost, Abed Elmajeed”, said the boy. And that to me sums up the spirit of the refugee children living in Za’atari.